Throughout recorded history, human beings have used special techniques and rituals in an attempt to divine the future. Some prophetic arts, such as the practice of examining the entrails of sacrificed animals, have died out altogether; others, such as astrology, are still in everyday use. Another technique which has roots in the distant past, but is still in use today, is the Tarot. There is a swirl of competing theories about the origins of what we know today as Tarot cards. Some say their use emerged from the magical traditions of ancient Egypt; some believe the Tarot’s roots lie in the corpus of Jewish mystical knowledge, the Cabbala; others say some early Christian sects, known as the Gnostics, originated their use. What is known is that the Gnostics did indeed depict elements of their spiritual beliefs on cards. The use of cards for divination purposes seems to have spread to Europe in the Middle Ages, perhaps transmitted by Gypsies.Some dismiss the Tarot cards as nothing but horoscope-style nonsense, but over the years a number of major historical figures have taken them seriously. Aleister Crowley, the notorious British occultist, and some say black magician, was fascinated by the Tarot, and had a special set hand painted by an artist of his own acquaintance. Even as distinguished a scientist as the psychologist Carl Jung, was intrigued by the Tarot tradition, and found the symboling of the cards to be genuinely profound. He drew parallels between them, the symbols appearing in dreams and those used in traditional myths. Standard decks of Tarot cards today contain 78 cards – 22 picture cards – known as the Major Arcana, and 56 other cards, known as the Minor Arcana, which are divided into four suits (wands, swords, cups, circles ) much like modern playing cards. It is primarily the cards of the Major Arcana which are used for divination purposes. They are believed to stand for traits of personality, or stages in our journey through life. Among the cards are The Magician, The Lover, The Hermit and The Fool . Interestingly, given the traditionally sinister associations of the number 13, Death is the 13th Arcanum. It is not actually considered unlucky, however, and does not necessarily relate to bodily death. Rather, it can often symbolise the ending of one of life’s chapters and the beginning of a new one. This can be a positive thing. Using Tarot cards to forecast the future is a little more complex than reading your horoscope in the daily paper. It requires training and study and an element of natural clairvoyance. 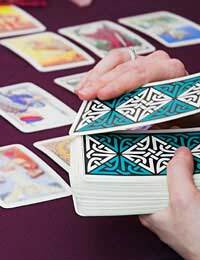 A Tarot reader is said to use the cards only as a spur to insight and divination. The cards themselves are not definitive. It is the perceptions they give rise to in the sensitive which matter. There is, in fact, no standard way of using Tarot cards to forecast the future. Different readers, those modern-day oracles, each have their own preferences. Some have the person whose future is being foretold first select a card from the pack; other say the card should be picked by a third party. Other cards are then placed around the first card in a specific order and pattern called a spread. Several different spread types exist, based on patterns such as a circle or a Celtic cross. Which one is used may depend on the preferences of the Tarot reader or the type of information being sought. Even in the scientific age, we continue to be fascinated by mysteries and the possibility of divination. Horoscopes still appear in the papers every day, and no doubt the Tarot will still be used for many years to come. Why not treat yourself to a reading sometime? Even if you don’t believe in it, it should at least prove to be an entertaining experience.